If you’d love the have all the advantages that a spiral staircase has to offer, but think the look might be a tad too modern for your traditional home, cast iron spiral stairs may be the perfect solution of blending a modern structure with a traditional material. Our iron spiral stairs stand out from others in our collection as the material is more malleable – thus allowing us to offer a wider selection of design styles for balusters and tips. And if you have something specific in mind, remember to ask us about custom options for your home. For homeowners who love the space saving style of spirals but don’t want to give up on ornateness, iron is an ideal material. To further customize your stairs, you may opt for wood tread covers to match your hardwood floors or furnishings, as well as choose from a variety of coatings for the metal. 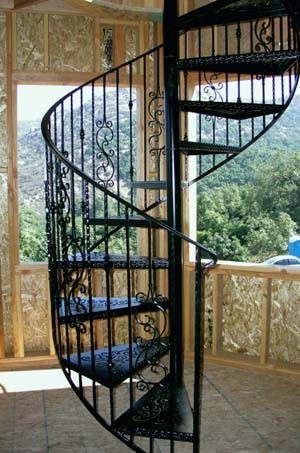 There are hundreds of ways that you can customize your iron stairs in order to best suit your home and your tastes. The following are a few of the areas in which you can make your stairs your own. Tread styles – while variations in tread styles may seem small at first, the finished look of the staircase will be unique with each style. Tread coverings – your iron staircase may have steel or solid wood treads. If you choose wood, you may select a hardwood variety and colour that matches your existing floor and furnishings. Balusters and tips – the variety of selection available in balusters and tips is greater for our iron spiral staircases than for any other material. Choose the designs that you like best, or ask us about custom staircases if you have another type of pattern or design in mind. Handrails – handrails are also highly customizable with iron spiral staircases. Pre-formed aluminium, polished brass and solid wood are all possibilities. If you’ve decided that an iron spiral staircase is what you want, you may be wondering whether it is better to go with a kit or to have a staircase that is custom made. Kits are undoubtedly the more economical way to go. And just because they are kits doesn’t mean that there aren’t options for personalization. As mentioned above, even with kits there are still many choices for the homeowner to make. If you have a very specific idea of what you want however, custom may be the way to go. Sure, you’re probably going to pay a bit more, but you are going to ensure that your unique vision for your staircase becomes a reality. Whichever option you choose, you can be assured that your beautiful and elegant iron staircase will be a showpiece in your home for many years to come. Spiral Stair People have been serving Canadians since 1968. We are Canada’s top manufacturer and distributor of iron spiral stair kits. Our customers can have peace of mind knowing that when they order from us they are getting the best quality and value.